My kids are big fans of the Lego video game franchise. They have all the Star Wars, Batman, Indiana Jones, and Lord of the Rings Lego games for the Wii. They hadn't tried the games for Xbox 360, but when our Wii recently went on the fritz, we agreed to try out the newest Lego Marvel Super Heroes game, now available at Walmart and Walmart.com. 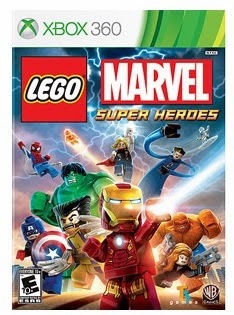 The boys had no problems adjusting their style of play for the Xbox, and they were immediately engrossed in this game that allowed two of them at a time to navigate a world where they can change into one of over a hundred Marvel characters while on screen. My boys have favored The Hulk, Spiderman, Black Widow, and more. They sometimes choose the good guys, often pick a few bad guys, but always use the skills each character uniquely possesses to scale buildings, thwart evil-doers, and explore a virtual world where almost anything is possible! Designed for kids 10 and up, it has mild Lego violence. (If you're not familiar, the characters can destroy most anything and anyone. Unlike other games, however, that show blood, the Legos characters don't "die"... they break up into Lego pieces, producing some round "coins", and then fade away.) My 3-year-old can play it well enough to do some "free play" -- not really accomplishing anything major, but following his brother and getting to interact with the environment a bit. We have been playing this every night since we got it, and the kids haven't tired of it. They have technically "beat" the game, but they haven't even begun to find all the tricks and treasures hidden throughout.